Today at Meet of Champions the girls all had successful races! In the first race of the day, the classic 6.5 k race, all three came in the top five (Caitlin in 5th, Helen in 2nd, and Kate in 4th). It was a very close race; everyone was within a minute of each other. Although the waxing was tricky we managed to find a great mix of klister that gave both kick and glide, which can be rare while using klister. Not even the morning’s drizzle deterred us from having a good race day! In the afternoon skate relays we were teamed up in pairs: Caitlin and Helen, and Erin Perryman and Kate. Yet again, both of these speedy teams took medals in the sprint! Kate and Erin came in second, and Caitlin and Helen came in third. In the end it was a fun and busy day full of waxing (we did our own race-site waxing), warming-up, and racing! The meet of champs was a great race for most of us. We all had a great time and spent a nice amount of time hanging around in-between races. For most of us classic distance was one of the most interesting courses we have skied in a long time, I know for me the downhills were some of the most fun and scary that I have skied down even after the S-turns at Oak Hill. The sprint relay was a fun cumulation of the regular season for a lot of us, since it was extremely short and very fun to be able to just go for it 100% for the whole race. 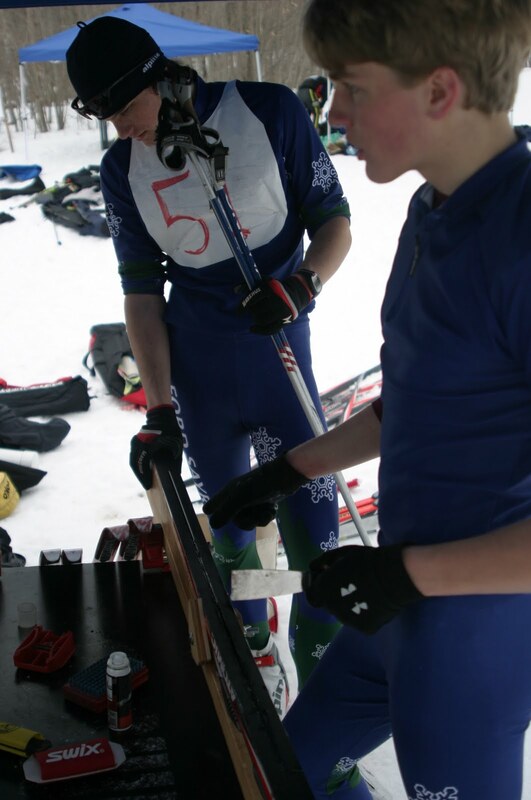 We had some great success at the race event though we weren’t counted as high school competitors. Many of us scored in the top ten, which for such a challenging course is a nice feat. Many of the corners felt as if we were skiing a GS course, completely iced out on the inside and very sharp narrow turns. Afterwards we all did our own thing to recover on Sunday. To the great pleasure of the Hanover High students we had a snow day on Monday. For some of us this was a godsend since the JO sprints were on later in the day. We faithfully watched our skiers from NE progress through the qualifiers, quarter finals, semi finals, and finally for the elite the finals that went until around 9pm eastern time.